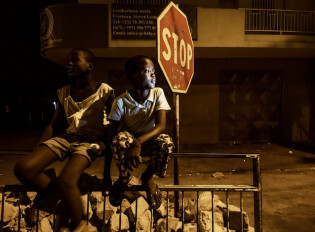 On a street corner in downtown Freetown, Sierra Leone’s capital city, 12-year-old Kaita sits with a friend on a peeling steel railing watching the headlights of motorbikes cruising through the otherwise silent streets. It is after midnight, and motionless human forms lie curled up in doorways or stretched out on pavements nearby. For Kaita, these streets are home, and have been for almost six years. On the fourth floor of a new office block in western Freetown, Cecil Williams sits beneath posters of idyllic tropical landscapes as he discusses the many natural attractions that once brought tourists flocking to the small West African nation of Sierra Leone. On a steamy, starless night in Sierra Leone’s capital, Freetown, a teenager runs desperately down a potholed street before being violently brought to the ground by a bystander. As word spreads that a thief has been caught, young men come running from all directions.